Aymen Derbali reacts to the guilty plea by Alexandre Bissonnette for the 2017 mosque shooting, Wednesday, March 28, 2018 at the hall of justice in Quebec City. Derbali was injured during the shooting and has been paralyzed since. In the 48 hours after Alexandre Bissonnette stood in court to own up to the mass murder of six Muslim worshippers, a bloody act that showed Canadians an unexpected face of extremism, a question was asked repeatedly among the small group of people who knew about the plea, including the judge: Why would he admit guilt now? The scene in the cavernous Quebec City courtroom on Wednesday where dozens of bereaved and healing Muslims filled the room with dignified calm and sadness, some taking a moment to comfort Mr. Bissonnette’s own stricken parents, suggested one potential answer: Maybe even a murderer can witness enough decency to set aside hate. As his trial was set to begin, Mr. Bissonnette pleaded guilty on Monday to the premeditated murder of six men and the attempted murder of 40 other people in the Quebec City mosque attack. It was a stunning reversal of his previous public denials. Superior Court Justice François Huot confirmed the first-degree murder conviction and then released the news from a publication ban on Wednesday. The killer will face a life sentence with no chance of parole for at least 25 years. Related: At the Quebec mosque shooting, this man risked his life to save others. Who will save him now? Prosecutors confirmed no plea bargain is in place. Justice Huot may decide to extend the convict’s parole ineligibility for the rest of his life after a sentencing hearing that begins April 10. Crown prosecutor Thomas Jacques saluted the “courage, resilience and dignity” shown on Wednesday by the survivors, family members of victims and the wider Muslim community. But, in fact, their dignified response started 14 months ago. Mr. Bissonnette walked into a mosque just before 8 p.m. on Sunday, Jan. 29, 2017, and opened fire on a group of worshippers who had just completed evening prayers. Friends, classmates and other acquaintances who knew him before the shooting said he had become fascinated by extreme right-wing politics and frequently expressed hateful anti-immigrant views. Within hours of the shooting and before the blood on the floor was dry, shocked members of the Islamic Cultural Centre threw open their doors to visitors to send a message of welcome. Over the next year, as the mosque received hate mail, the community was denied a decent burial ground by a Quebec town and the car of the mosque’s president was torched, the community emphasized peace, love and neighbourliness. Finally, in court on Wednesday, at least two members of the Muslim community whispered words of solace to Mr. Bissonnette’s parents, Manon Marchand and Raymond Bissonnette. “You have my sympathies,” one man said. The couple smiled back painfully with red-rimmed eyes. On Monday, Alexandre Bissonnette took his turn to do the one decent thing he could do. He said he decided months ago to admit guilt to avoid putting survivors, victims’ families and his own family through more pain. His lawyers advised him to wait for all the evidence to be in their hands before telling the judge. The final pieces arrived Sunday night. Unusually, Justice Huot ordered one last psychiatric evaluation to make sure Mr. Bissonnette was mentally fit to make the guilty plea. “I absolutely don’t want to take any chances. I want things done in a manner that is clear, straight, correct and legal,” the judge said. Forty-eight hours later, the courtroom now packed, psychiatrist Sylvain Faucher said Mr. Bissonnette was the fittest and healthiest he’s been in the seven times they’ve met. The judge moved quickly to confirm the convictions. The widows, daughters, sons and friends of the shooting victims filled row after row of seats, providing a visual image of the breadth of the attack’s impact. In the front row sat three mosque widows: Khadija Thabti, Safia Hamoudi and Idiatou Barry. When Mr. Bissonnette entered the courtroom, some of them shut their eyes. One by one, the judge named their dead husbands and three other men – Azzeddine Soufiane, Khaled Belkacemi, Ibrahima Barry, Mamadou Tanou Barry, Abdelkrim Hassane and Boubaker Thabti – as he confirmed the conviction for first-degree murder. One of the women cried. 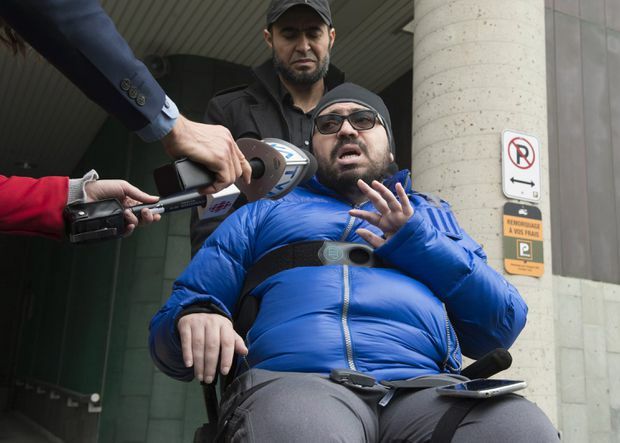 In the centre of the room was Aymen Derbali, paralyzed after being hit by seven of Mr. Bissonnette’s bullets, some of which he took deliberately to distract the gunman. He watched proceedings from his wheelchair. Not far away sat Said Akjour. Mr. Bissonnette shot him in the shoulder. Justice Huot named them, too, along with Said El Amari, Nizar Ghali and Mohamed Khabar as he pronounced five convictions for the attempted murder of the men who were shot and lived. Finally, the judge named 35 other people who were present that night, including four children who were identified only by initials and birthdates. Mr. Bissonnette admitted he attempted to murder them, too. Mr. Bissonnette gave a three-minute statement expressing regret and explaining why he changed his mind on his plea. “I’m ashamed of what I’ve done,” he said. He became suicidal and was obsessed with death in recent years, he said. Mr. Bissonnette’s denial that he was motivated by Islamophobia was met with skepticism. Other leaders said Mr. Bissonnette’s statement fell short of providing the in-depth insight the community needs. “They were left wanting more. It was very short given the scope of the tragedy,” mosque president Mohamed Labidi said. Both the prosecution and defence say they plan to introduce extensive amounts of evidence at next month’s sentencing hearing. Mr. Labidi hopes it will provide a few more answers.